Clunes is blessed with a variety of options for those wishing to take in its relaxed lifestyle and heritage precinct. 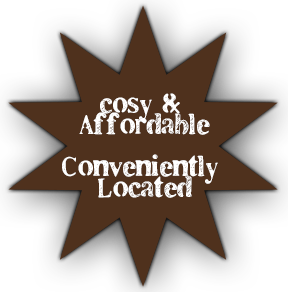 Whether you’re on a weekend country get-away or planning an extended holiday, there’s plenty to choose from in the area. 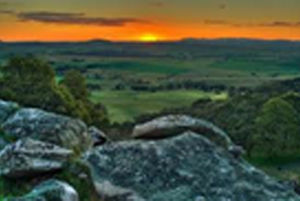 The Central Victorian Goldfields region is renown for it’s hidden hide-aways and Clunes is definitely one of them. 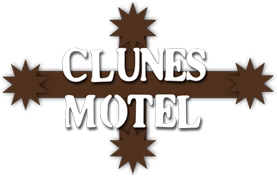 At the Clunes Motel we have an in-depth knowledge of the many attractions and places of interest in the Region. The discovery of gold in the area in 1851 signalled the beginning of the goldrush in Victoria. A historic goldmining town, nestling in a picturesque valley, Clunes remains one of the most original and intact gold towns in Australia. 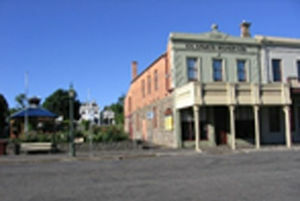 ‘Historic Clunes’ has been used as a film location site for such movies as Mad Max, the remake of the 1950’s classic On the Beach and Ned Kelly, as well as more recent ABC television series Queen Kat, Carmel & St. Jude and Something in the Air. Centrally located to Ballarat, Daylesford, Maryborough, Castlemaine and Malden, the Clunes Motel is within an easy drive to over 20 wineries. In its heyday, Clunes was the fifth-largest town in the Colony. Today, ‘Creative Clunes’ is a charming village, home to a vibrant, creative community of artists, authors, historians and photographers. Clunes is known for an intriguing range of cafes, galleries, wineries and dusty antique and collectible stores. 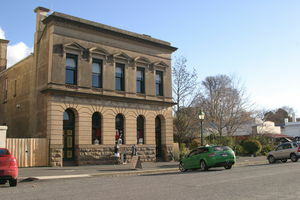 There are over 50 buildings of historical signifance in and around Clunes. In 1839, Donald Cameron selected land and named his run Clunes after his home in Scotland. By 1855, the 'Ballarat Star' reported there were about 250 people on the 'old Clunes diggings'. By about 1857 Clunes was beginning to move out of the classification of a mining camp and the signs of a township were becoming apparent. One of the signs was the establishment of the Port Phillip Gold Mining Company, which had come to work the great quartz reefs of Clunes. The Port Phillip created the need for a stable workforce. Other mines later were to open up. A lone pine tree stands as a sentinel crowning this picturesque granite outcrop. A sanctuary for native plants and animals, MBSR offers magnificent views and a rich variety of spring wildflowers.The best way to enjoy the park is on foot. A network of tracks links all major features within the reserve. A walk to the summit is rewarded with breathtaking views of the surrounding countryside. 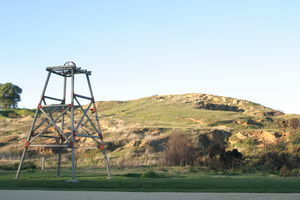 Other activities that can be enjoyed in the park are picnicking, horse riding and mountain biking. The historic primary school is a splendid building which has recently been restored. 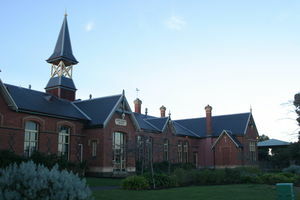 It is situated in Canterbury St. The new brick school, of six large rooms and four class rooms, has a slate roof and was built by Spence, Purcie and Co., for £4,755. It was opened on July 1, 1875. Fencing cost £99.17.6; the bell cost £23 and was erected in 1877; gas was on in 1878 for £12; a verandah was erected in 1888. Remodelling cost £848 in 1913 and further remodelling in 1914 cost £264. Looking across street to a double storey building, the Old State Savings Bank with pediments over upper storey windows, balconets at windows, parapet and cornice at roofline, arched windows and door at ground level. The Old Savings Bank now sells a collection of natural gold nuggets, jewellery, antiques, reproductions and giftware to the public. Designed by the architect Leonard Terry as the Clunes London Chartered Bank, construction of the building commenced in 1871. 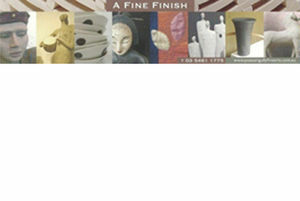 In 1921 it became the English, Scottish and Australian Bank (E.S. & A.) 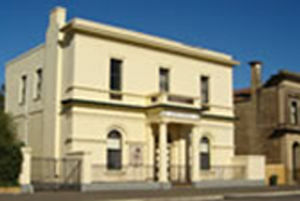 and is currently used by the Clunes RSL as club rooms and to house their collection of memorabilia. 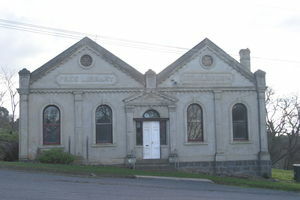 In 1872 just under £570 was allocated to building The Clunes Mechanics Institute. By 1874 the Institute decided to alter its constitution to form a Free Lending Library. In 1875 the new committee purchased the site. Additional work continued on the building, adding a skylight and enlarging the reading room which was completed in 1882. The building is substantially intact and is currently undergoing restoration. It is used as a meeting and rehearsal space. The CCIC project will see the Clunes Museum redeveloped and expanded to create the Clunes Community and Interpretive Centre, a multifunctional tourism, heritage and community asset. The building will nearly triple in size. 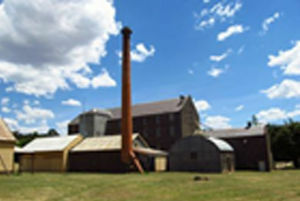 The Mill Is a particularly important part of Victoria’s Goldfield’s heritage. It draws together so many of the threads that make up the colourful tapestry of the goldrush era. A festival has been conducted for many years and is a celebration of local foods, wine and music, and for 2012 the festival coincided with the 150th Anniversary of the Mill. A Mecca for train enthusiastics, this station boasts one of the longest platforms in the southern hemisphere. Admire the highly polished timber ceiling and beautiful tessellated floor in the main entrance. During the 1860’s, the rail network started to make its way through the untamed bush of Victoria. John Thomas won the second of two tenders to bring the railway line into Maryborough from Newstead. Built in 1890, Mark Twain remarked when visiting 'a station with a town attached'. Near Maryborough, this is an interesting mud brick structure set in a beautiful garden which forms a natural background for the many pieces of garden sculpture. It is also the home of many and varied native bird species, diverse pieces of art, including jewelry, and close to many fine restaurants. If churches and their architecture are your passion, Clunes has a few of the vast number to be found in the region. Of the churches, the Wesleyans had the largest congregation (boosted by the many Cornish miners in Clunes) and this is clearly demonstrated by their church in Service Street. 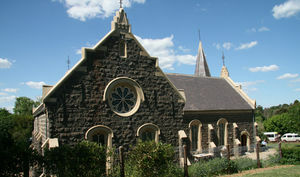 This distinctive bluestone building in the Gothic style was designed by the Ballarat architect J.A. Doane, begun in 1864 and extended in 1871. It consists of a broad nave and transepts with galleries, these having cast iron balustrades. The facade incorporates a slate-roofed octagonal turret and spire and a four-light perpendicular Gothic window. The interior includes windows with quarry glass panes and coloured borders; those on either side of the organ incorporate scrolled texts and may be by the Melbourne makers Ferguson & Urie. 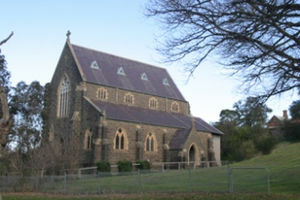 With declining congregations, the property was taken over by Wesley College and has been developed as its Clunes campus. The church building has received a very extensive restoration, including structural strengthening, the opening out of the interior to its original dimensions and the installation of a new floor. St. Paul’s Anglical Church, built in 1870-71 of bluestone with cement dressings, is in the Decorated Gothic mode, and is the only identifiable Australian work of the architect Thomas Austin of Austin and Johnson, an able protege of the famous English Gothicist Sir George Gilbert Scott. It consists of a large and broad nave and porch. The organ was built by Hamlin & Son, 8 Brook Street, Euston. Road, London, around 1866. Robert Hamlin was a former employee of Hill & Son and this instrument bears characteristics of their work, particularly the two tapered ranks in the Swell Organ and style of drawstop engraving. This Bluestone church was designed by H. R. Caselli and W. B. Tappin and was built in 1873-74. 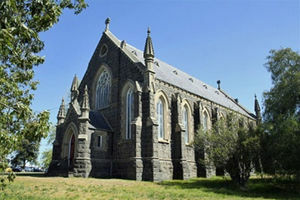 It was based upon the plans for the St Patrick's in Ballarat and the St Patrick's in Port Fairy (both designed by Charles Hansom). St Thomas Aquinas Catholic Church dates from 1873. Impressive institutional buildings began to be erected in the 1860s and 70s, culminating in the grandiose Town Hall (1872-73) and urbane Post and Telegraph Office (1878-79). In July 1851 it was announced that payable gold had been discovered near Clunes. Clunes' fortunes fluctuated during the early 1850s and it was not until the Port Phillip and Colonial Gold Mining Company began quartz crushing operations that the town experienced significant development. The township of Clunes was surveyed in 1858 and in 1861, Allotment 7 of Section 4 was temporarily reserved for municipal purposes for the newly proclaimed Borough of Clunes. Architect Percy Oakden was appointed to produce a design for the Town Hall, Borough Offices and Court House in late 1871. 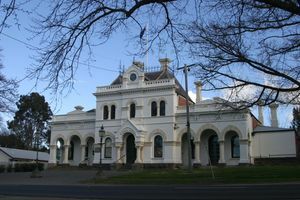 A grant of £2100 from the Victorian Government to the Clunes Borough Council for a court house, tied to a 999 year lease, provided sufficient funds to construct a substantial civic building. The foundation stone was laid by the Chief Secretary of Victoria, Charles Gavan Duffy in April 1872 and the Town Hall opened in May 1873. 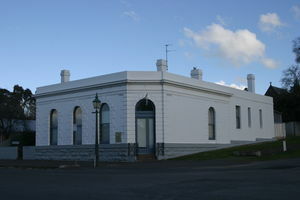 The Clunes Town Hall and Court House was designed by Percy Oakden and constructed by William Cowland in 1872-3. The distinctive Victorian Free Classical style building is a reflection of the civic pride and community confidence of a gold town at the peak of its prosperity.